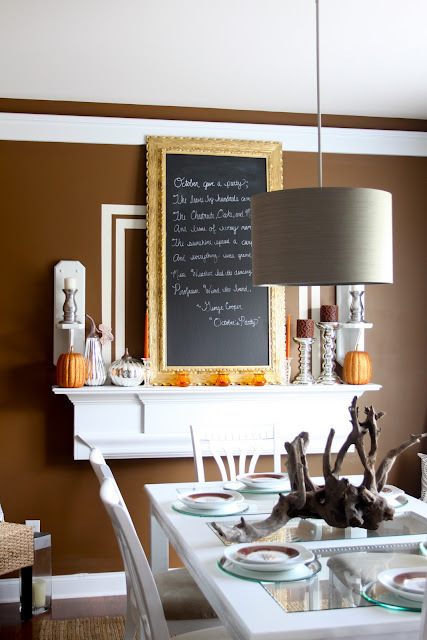 Dwellings By DeVore: Happy Fall Y'all! If you haven't figured it out yet, you'll soon realize that fall is my favorite time of year. I love pretty much everything about it, the changing leaves, the cozy cable knit sweaters and riding boots, the pumpkin spice lattes, heck pumpkin anything! Since it's my favorite time of year, I always do a little decorating for it. Nothing extravagant just a little something to put that fall mood in the air. This year I recycled most of my decorations from last year but tried to use them in a new way and added a few new things to freshen it up a bit. There's a mini before and after involved in this fall mantle. I found this HUGE picture at Goodwill for $9.99. I thought that was a great deal considering the size of this thing. I spraypainted the frame gold (it was already gold but needed some freshening up) and then used some chalkboard paint where the picture was. The picture was printed on a MDF sort of material so I just painted directly over it. So there you have it. Next up, decorating the front porch. Do you love fall as much as I do? do any decorating for it? These pumpkins are cute! I will check that section out in Target, thanks! :) and the chalkboard is perfect. 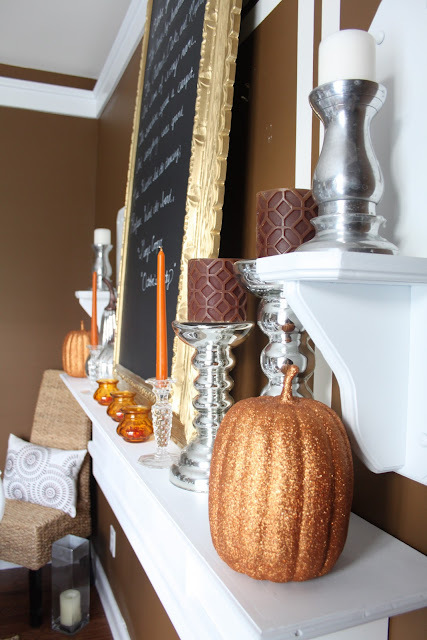 I'm trying to start decorating for fall but its hard when temperatures are still in the 100s and 90s here :) mentally it doesn't feel right to start decorating yet! maybe in October.. I LOVE it! and girl you know I love me some gold! Its beautiful. LOVE THE CHALKBOARD SO PRETTY, ID LOVE TO FEATURE IT ON MY NEXT REVIVAL MONDAY IF THAT WOULD BE OK WITH YOU LET ME KNOW. I read those comments too and am jawdropped at all of the ridiculous ones. Please take them as that...ridiculous. Your desk looks fantastic, the urn is perfect where it is, who cares where the heck your mouse is gonna be (really?? These people commenting are hiding behind the anomymity of there computer to be just ridiculous...Excellent job as usual..
ohh! I love the frame/chalkboard creation you found - it's gorgeous! 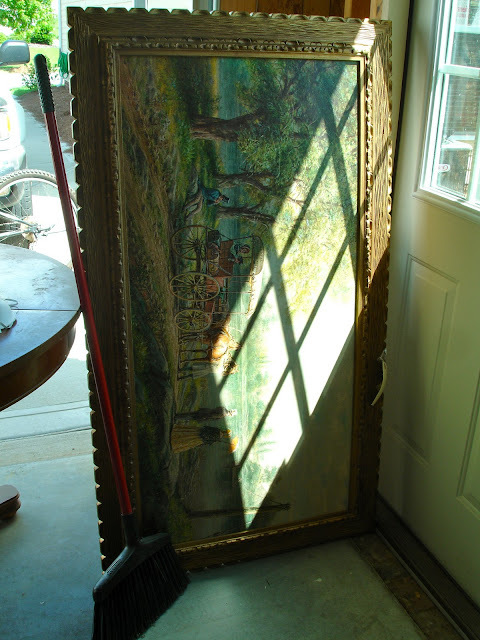 Now I want to go hit up goodwill again :) That was a pretty awesome price too, considering the size of the piece. 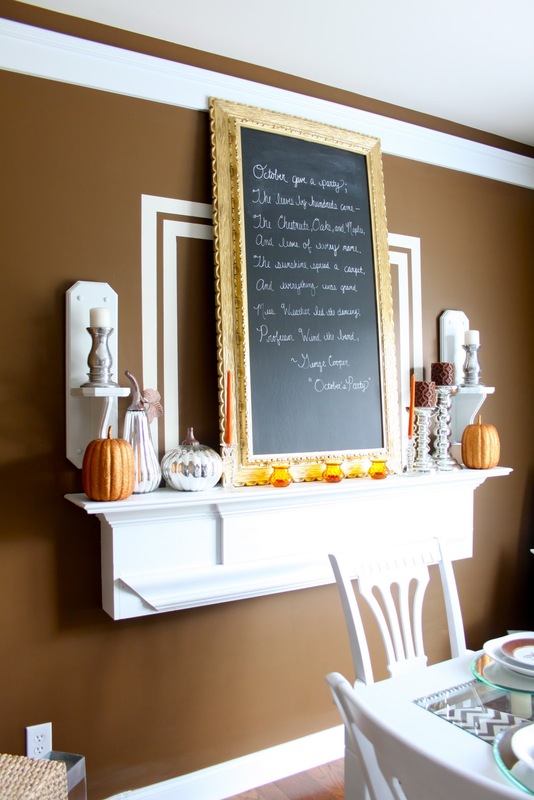 The mantel looks fabulous! I have almost the same frame with ugly painting except mine is a canvas only so I need to get MDF cut so I can paint a chalkboard as well. Now, just where to put it?